On January 22th-23th, 2019, the world’s most influential leaders and innovators gathered at the Marina Bay Sands Expo and Convention Centre in Singapore for the the world’s most influential conference on emerging technologies "EmTech Asia 2019". 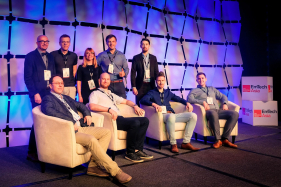 At this event, the representatives of the Center for Physical Sciences and Technology (FTMC) Karolis Stašys and dr. Jan Devenson introduced collaboration opportunities in the fields of space industry and artificial intelligence. Co-organised by MIT Technology Review and sponsored by Facebook, "EmTech Asia 2019" focused on emerging technologies and their impact. This event was a great opportunity to meet other innovators and establish contacts with potential investors. "This conference is considered very successful in spreading the name of Lithuania as a reliable partner and high technology country", said Karolis Stašys, Innovation Manager at FTMC.